The first annual Championship event held by ukpokerinfo.co.uk was a real success. The event, held on Sunday 29th May at the Wired Club in Stoke on Trent, was packed to capacity and could have sold at least 100% more than the allocated seats - with 43 people on the reserve list! The tournament was a freezeout event with 10,000 starting stacks. Thirty-eight players were in attendance (club capacity) and everyone had a fantastic time. Players from Birmingham, Stoke, London, Newcastle, Crewe to name a few made the journey. Although money was of course in the minds of the players, the trophies provided for the top 3 places were highly sought after. There was no way that a final table deal would be made with this crowd. Although the tournament was managed by Wired Club owner, Jim Fryer, in attendance to help was leading UK Tournament Director, Richard Wootton. Having Richard at the venue gave a great added boost to events and he was highly appreciated by both players and club staff. The tournament started at 12p.m. sharp and the atmosphere was tense. Early on, one table lost two high-profile local players, who I assume could not get used to the large-stack game and went out within 10 hands! Tournament favourites, Darren Sutton and Jon Marlow were low stacked after an hour of play and things were not looking great for them. Early chip leaders were James Lambourne and Matt Aguilera, both young players with a great future in the game. At the break, because of the high starting stacks, only four players had exited the game, leaving an fairly even field. At 6p.m. 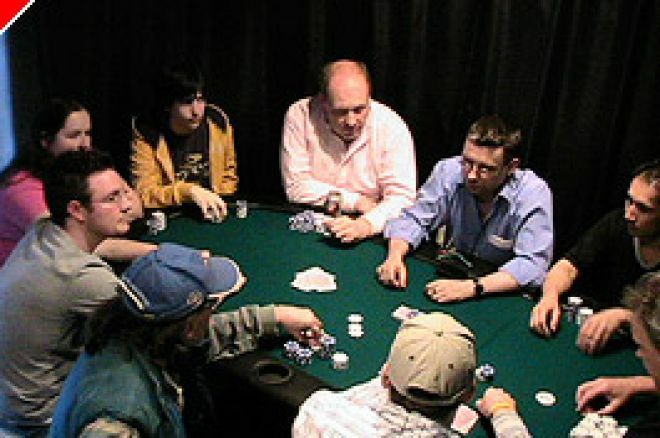 the final table was decided. A mixture of midlands veterans such as Rob Cook and excellent internet players provided the contingent. Chip leader at this point by some way was Crewe-based cash game veteran, Phil Yates. First to leave was Ben Aspley, a local up-and-coming talent who arrived as the table short-stack. Eventually the table was thinned down to Martin Smith and Jon Marlow, both tight-aggressive players from opposite ends of the age spectrum! At one point, Marlow had a 10 to 1 chip advantage over smith, but a couple of missed opportunited allowed Smith back into the game, eventually calling Marlow’s Queen Jack all-in with King Ten of Hearts. Play finished at 8p.m. with many players still at the venue enjoying the final table atmosphere. Prizes were given out to the final 3 players and all other finalists received a medallion for reaching the last 10. It was a pleasure to be involved in such a thrilling poker event and a joy to hear plaudits from many casino players who had never played with such high starting stacks or such length blind structures. Lets hope that more poker venues take note.